We scoured the internet and found some fascinating predictions for this year. It’s January 1, 2018, and the internet is itching to find out what this year holds in store for all of us. 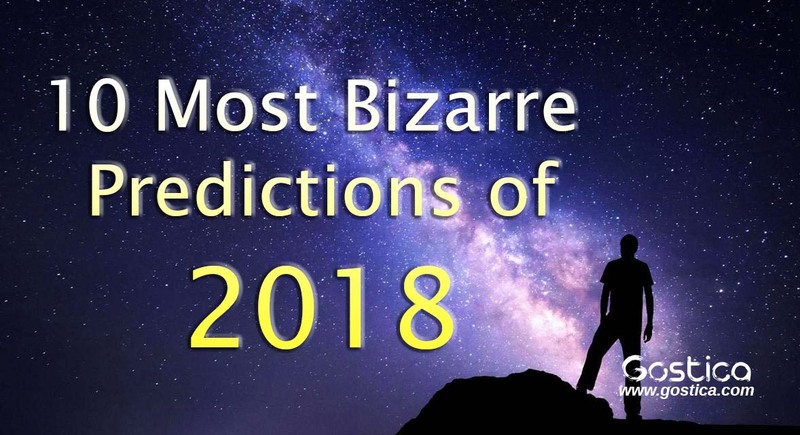 It may be something stupid or it may actually freak you out but we’ve scoured the internet and come up with some interesting revelations and predictions for this new year. Here are 10 of the most insane predictions for 2018. Bulgarian mystic Baba Vanga predicted that China would become the next big superpower in 2018. This news has been circulated on the internet for a few years now, but Vanga’s predictions are apparently true because she accurately predicted the 9-11 attack on the World Trade Centre. Another of Vanga’s predictions is that the human race will look to the planet Venus for a new source of energy. As we mentioned before, some of these predictions are a little crazy so this one may not be entirely true. This seems to be the most likely to come true out of all the predictions for this year. Alexei Navalny, the main opposition leader to Putin, was banned from standing for President under a slew of corruption charges. He has also said that these are politically motivated. This isn’t going to stop Putin from assuming the title again which will make him a dominant political figure in Russia for 25 years. Anything can happen in politics in a week’s time. After Roy Moore’s loss in Alabama against Doug Jones, to Trump’s rapidly declining approval ratings, the country might shift to voting for the Democrats. Analysts from CNN also predict that the population could shift to blue and that the Democrats will win by a huge margin. There have already been a ton of articles covering the royal wedding and the couple in question. From articles about Meghan Markle’s mother to stories about Prince Harry’s wild past, we’ve all lapped up stories relating to the royal couple. Be prepared to see more news about the couple and their wedding till it happens in the May of 2018. The German team is mesmerizing to watch on the field. Their movements are precise and they do not hesitate to charge at their enemies while playing. This tends to intimidate a lot of players from other teams and that’s all the team needs. Riding high on their crushing win four years ago, Germany will probably retain the FIFA title of World Champions this year in Russia as well. According to Indy100, Gordon Ritter, the founder and general partner of an enterprise cloud venture firm, said, “Many companies which raised large sums based solely on buzzword-laden pitch decks will fail. Nostradamus said: “The big war will start in France and all of Europe will be attacked, it will be long and terrifying for everyone and then finally there will be peace but only a few will enjoy it. A war will start between the two great world powers and it will last for a period of 27 years.” Better get your fallout bunkers ready. Nostradamus said: “An earthquake shall concern particularly the western area of the United States. Its power shall be felt in lands throughout the globe.” If that’s not terrifying enough, check this out. In 2016, the US Geological Survey (USGS) found a series of medium tremors. They monitor the Cascadia Subduction Zone and the two fault lines in California, one of them is San Andreas. The Cascadia Subduction Zone is the most worrying apparently. Everyone knows the legend of Pompeii. If you Google it, you will find horrifying images of people frozen in time and place because the ash from the volcano has perfectly preserved their bodies.